Nobody old enough to watch the news in 2000 can forget it - the caravans of armored trucks carrying ballots, the debate over loose, missing and even "pregnant chads," the election jokes told around the world, and finally a vote count of 7-2. It was not a talley of votes by those who are supposed to vote, but rather by nine Supreme Court justices. And they handed the prize to the loser. 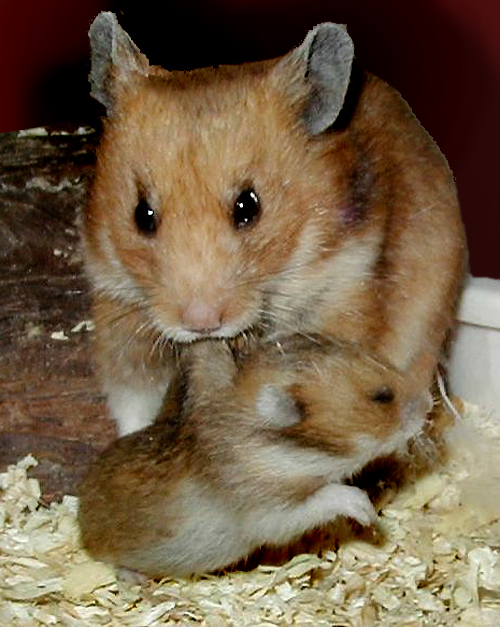 And it all started back on the 24th of March that year when a hamster named Jade gave birth to a litter of five babies. 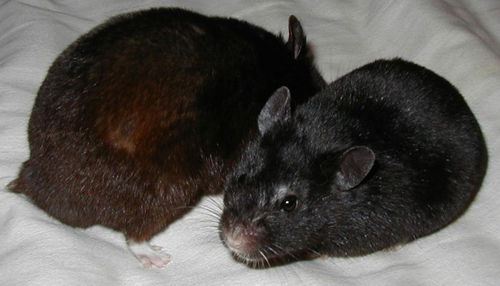 Among them were two brothers, brown-striped Diddley Squat IV and Yarash, Jr., nicknamed "YJ." Mother Jade is shown above presenting little Diddley to the world on his two-week birthday (7 April). The pair were picked at a Washington, DC convention as the nominees for the general election in November of 2004. The web site was re-designed to show off their young faces and optimistic slogans. And almost overnight, they were up and running! Diddley Squat at one month of age. 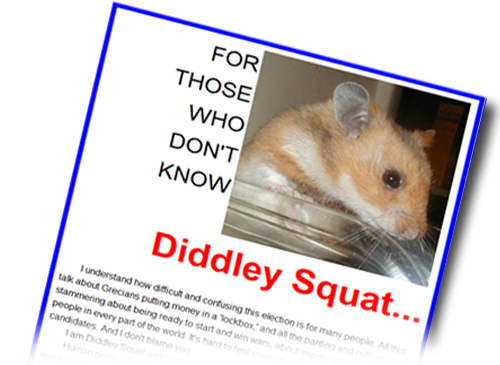 In fact, no hamster candidates so caught the public imagination as Diddley Squat and Yarash Junior. Their faces appeared in newspapers and on-line magazines, even in flyers distributed on college campuses. They were interviewed for publication and on radio. 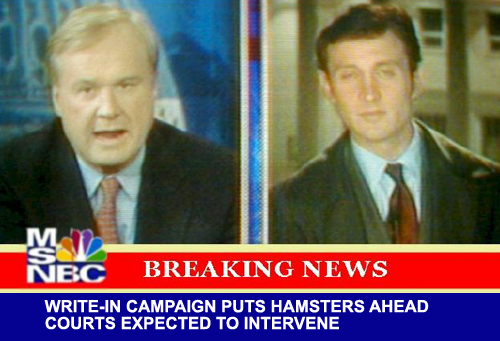 And they were even featured in the first-ever Hamster For President video. 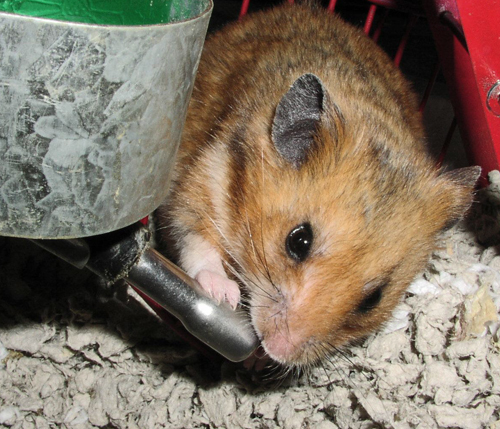 They brought the Hamster For President cause to new heights. Diddley Squat with his bride-to-be. The photo is dated 9 August 2000. And while their professional lives flourished beyond anyone's dreams, they suffered both joy and sorrow in their lives. Diddley Squat was married on the 15th of September 2000 to the beautiful Ebony. And although they had ten children, none survived their infancy. Then, on Christmas day of 2001, he suffered an even greater blow when his beloved wife passed away. Yarash Jr. ("YJ") married Ersee (right) in January of 2001. Yarash, Jr. married the youthful and vibrant Ersee on 3 January 2001. Their family life fared better. They raised a total of sixteen children, who in turn produced numerous grandchildren, great grandchildren, and great great grandchildren. By 2010, their descendants numbered in the thousands, with several of them still in the HFP community. 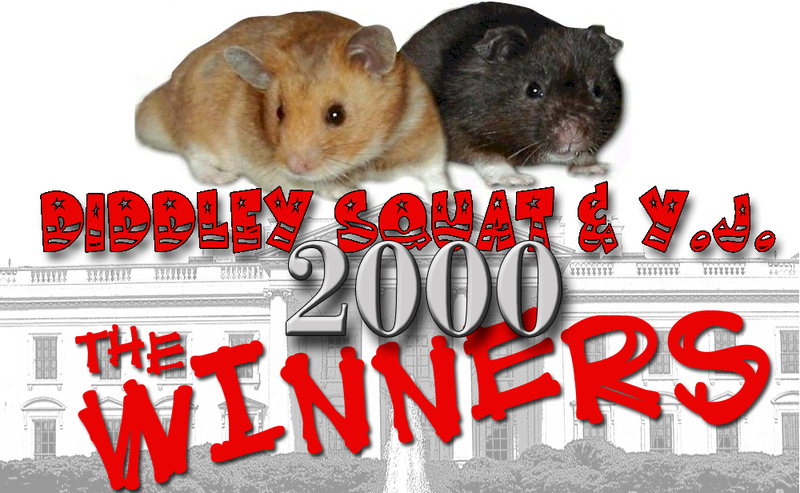 A typical flyer distributed by the 2000 campaign. The extraordinary Yarash Junior died at 1:22 p.m. on 20 January 2002, not long after he resigned as vice-presidential candidate due to a rare skin disease. His wife Ersee lived until 19 June 2002. 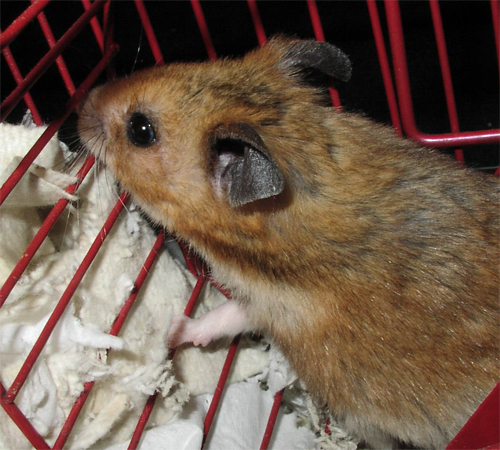 "YJ" as a senior hamster in late 2001. Diddley Squat, who continued to grow in wisdom and character as he advanced in age, sufffered a stroke on June 18 2002, and died just minutes later. His death came just five hours before that of his sister-in-law, Ersee. He was 27 months old. 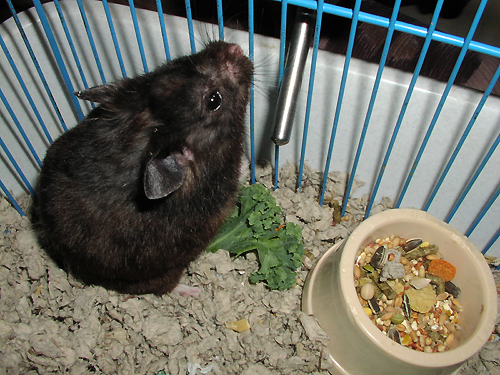 A mature Diddley Squat drinks from his water bottle. The photo was taken 30 December 2001. 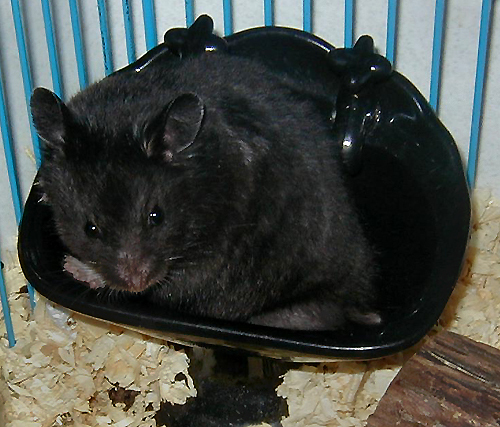 Diddley Squat IV is shown here on his wheel. He was 21 months old when the photo was taken. In early December of 2000, when thousands of votes had either been counted, lost or mangled so badly they had to be scrapped, the "under-votes" held the lead. The term "under-vote" refers to a name written by the voter beneath - or under - the printed names on the ballot. These are votes for write-in candidates. And the only national write-in campaign was waged by Diddley Squat IV and his brother and running mate, Yarash, Jr. 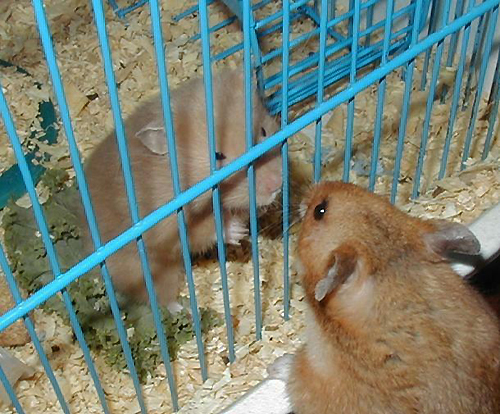 Though disappointed, the hamsters were philosophical about the theft of the election they worked so hard to win. 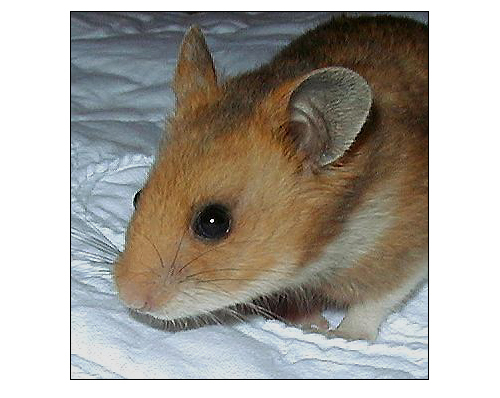 "We know we did it," YJ told reporters at the Rodent Weekly "And if we can do it, so can the next set of candidates. We go into the next race stronger than ever."